A Satisfying salad is hard to find. But we have the right recipes for you! A satisfying salad is a paradox in nature! That’s what we all believe! It’s only 3 pm, and that means there’s at least another 4 hours to go before dinner. We know only too well that it’s the random snacking at tea-time that kills! But the hunger pangs are hitting home aggressively. Lesson learnt: A salad for lunch is just not enough! If most salad-lunch days leave you feeling like this, here’s some food for thought … literally! 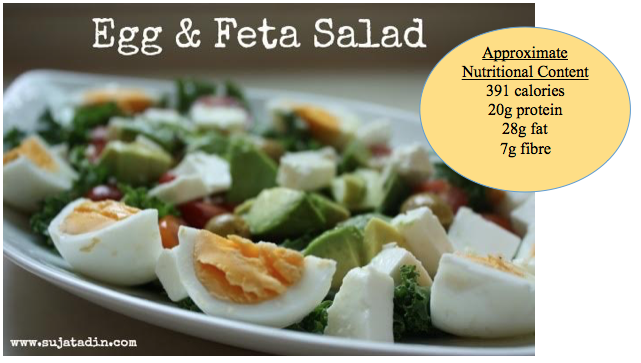 If within 2 hours of your salad-lunch, you find you are rummaging through the pantry or hitting the coffee-shop, chances are your salad was lacking in healthy protein and fat. I’m sharing 3 simple recipes for you to try out. 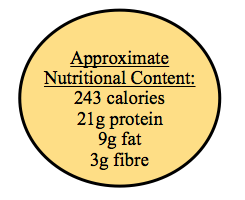 While I am not one to count calories, I have included an estimated nutritional content so you can check out the amount of fat, protein and fibre in each of the recipes. 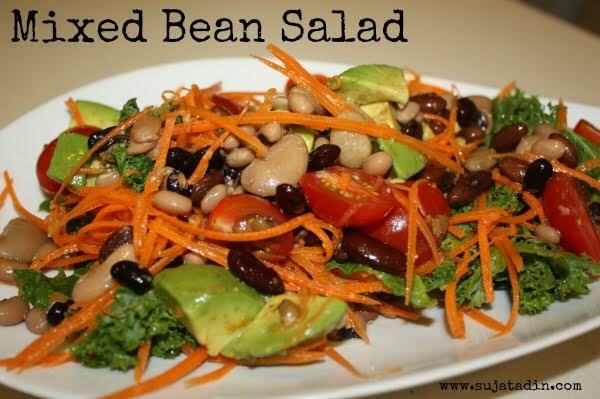 Note: I have kept it simple by using the same dressing for all 3 salads, since the focus here is on ensuring sufficient fat and protein … but you can vary it. Options include Balsamic vinegar, Miso, English mustard etc. Use any beans that you like; I used mixed beans that were soaked overnight and then pressure-cooked. Wash and dry the kale leaves, and place on a serving plate. Layer all the other ingredients over, and pour on the dressing. Boil the eggs and, once cool, cut them and place around the edge of the serving plate. Place the kale leaves in the middle and layer the other ingredients over. In a bowl, mix the dressing into the lettuce, cherry tomatoes, cucumber slices and shallot. As you can see in these salad recipes, the choice of things that go into a salad can easily be tweaked to improve protein and fat content, and leave you feeling fuller for longer. Other good sources of protein to include in salads are skinless grilled chicken meat, cottage cheese and pre-cooked prawn or salmon. Vegetarian options are tofu, tempeh, cooked beans (chickpeas, kidney beans, lima beans, sprouted mung, black beans, edamame, etc.) and, of course, the popular nuts and seeds. So, do try these recipes out, and tell us if they were satisfying enough for you. If you liked these recipes then you might like our Quinoa Pulao Recipe as well. Click here to get it from FUCHSIA Food and Health! Sujata Din is a Certified Holistic Health Coach based in Singapore. Sujata assists clients all over the world through individual face-to-face consultation, as well as consultation over Skype, telephone and Email. She equips clients with tools, information and strategies that lead them to better health, higher energy levels and, ultimately, a happier disposition. On top of individual consultations, Sujata conducts workshops on nutrition, cooking demonstrations and pantry overhauls.